When will be Saturday Night Live: Weekend Update next episode air date? Is Saturday Night Live: Weekend Update renewed or cancelled? Where to countdown Saturday Night Live: Weekend Update air dates? Is Saturday Night Live: Weekend Update worth watching? NBC is bringing a late-night institution to primetime with a four-episode order for Saturday Night Live: Weekend Update. The half-hour telecast will feature "Weekend Update" anchors Colin Jost and Michael Che. Additional "Saturday Night Live" cast members will also make appearances. Weekend Update," which comments on and satirizes the news and current affairs of the week, has consistently ranked as one of the most popular segments of "Saturday Night Live" throughout the show's storied 42-year history. Colin Jost and Michael Che anchor Weekend Update Summer Edition on August 10, 2017. Colin Jost and Michael Che anchor Weekend Update Summer Edition on August 17, 2017. Colin Jost and Michael Che anchor Weekend Update Summer Edition on August 24, 2017. Saturday Night Live: Weekend Update next episode air date provides TVMaze for you. 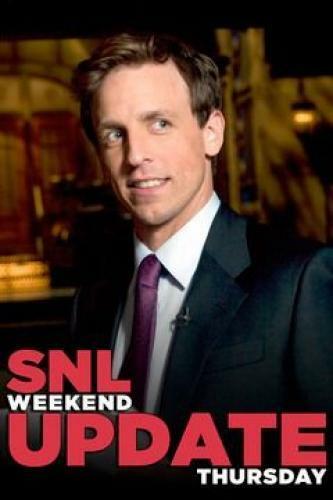 EpisoDate.com is your TV show guide to Countdown Saturday Night Live: Weekend Update Episode Air Dates and to stay in touch with Saturday Night Live: Weekend Update next episode Air Date and your others favorite TV Shows. Add the shows you like to a "Watchlist" and let the site take it from there.